With its creative design and its innovative details, this handcrafted, Spanish colonial settee will be a focal point in your home décor. The settee has a wide, rectangular seatback, and the seatback is adorned with dramatic, triangular cut designs. 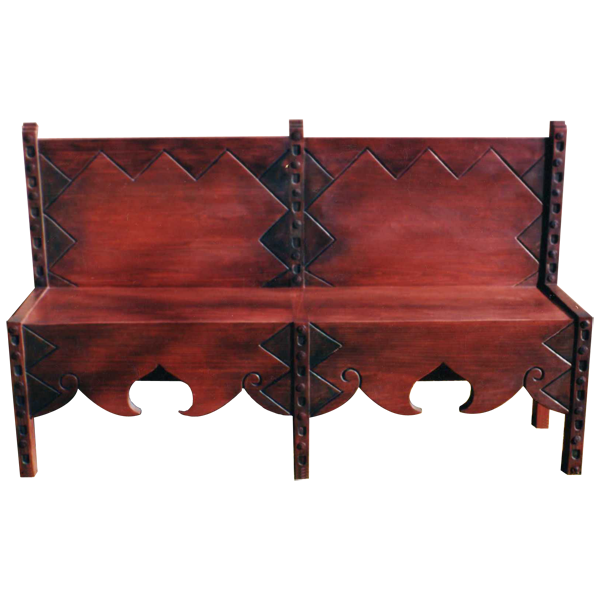 The wide seat is made of solid wood, and the below the seat is a front apron embellished with curved, Granada style, wood cut designs. The settee is supported by six, straight legs, and each leg is enhanced with an alternating design consisting of a hand forged, iron, nail head followed by a hand carved hole. It has a gorgeous, red stain with a black highlighted finish, and it is made with the best, sustainable, solid wood available. The bench is 100% customizable.